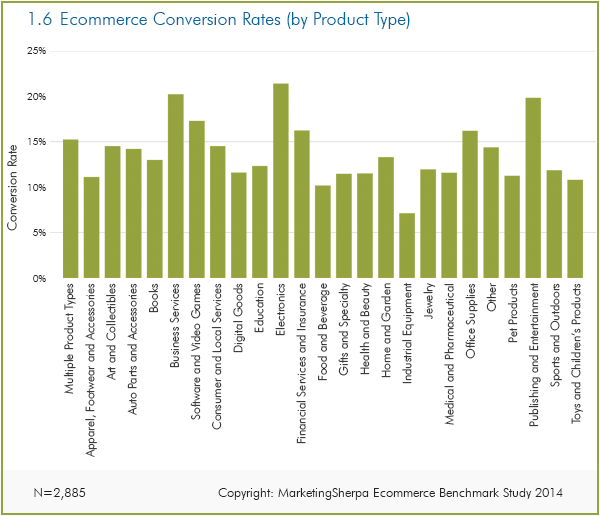 Email is one of the top converting channels for a lot of businesses. The challenge most face is actually acquiring new subscribers. I've shared a range of techniques to grow your email list based on my experience doing just that. For most business operating online, email is a powerful channel for nurturing leads through the sales funnel to eventually convert them into customers. A recent study from MarketingSherpa showed that e-commerce businesses had an average conversion rate from email of between 7% and 22%. That's a pretty large figure and shows the importance of having a clear strategy in place for both acquiring new email data and ensuring that those within your list on the right path to becoming customers. Over the past few years I've tried out endless techniques to help grow my email subscriber list. Some of them worked really well and others were a complete disaster. The most important thing of all is to test. I'm going to outline some of the best techniques that you can execute to grow your email list, some of the tools that will help and how you can prevent your list from becoming worthless. Below are a few quick links to the individual techniques that I've outlined within this article. I've curated 61 different examples of high-conversion CTAs that you can use as inspiration for within your own website. One of my favourite experiments that I've seen run when it comes to increasing email subscribers is from a colleague of mine, Pam Vaughan. Pam found that, like with a lot of websites, a large portion of all HubSpot's leads were coming from a very small portion of the pages on the website. In fact, 46% of all leads from the blog came from 0.5% of the total content. Crazy, right? Well, it's not that crazy, really. If you go and check out the top channel for driving traffic through to your website, outside of paid, this is likely to be organic search. If you then drill down on how many URLs within your site are contributing towards 50% of your organic traffic, then I'd imagine you'll be seeing similarly small numbers. Whilst you may think this is a bad thing, there are some upsides to it. Identify the keywords being searched for most frequently for each top traffic-driving page. Create an offer (e.g. ebook, template, etc.) related to the keyword. Add a call to action to download the offer within the blog. An example of this was on a blog post about how to create a great press release. Previously, the blog post had a CTA to download a "newsworthy guide to public relations." 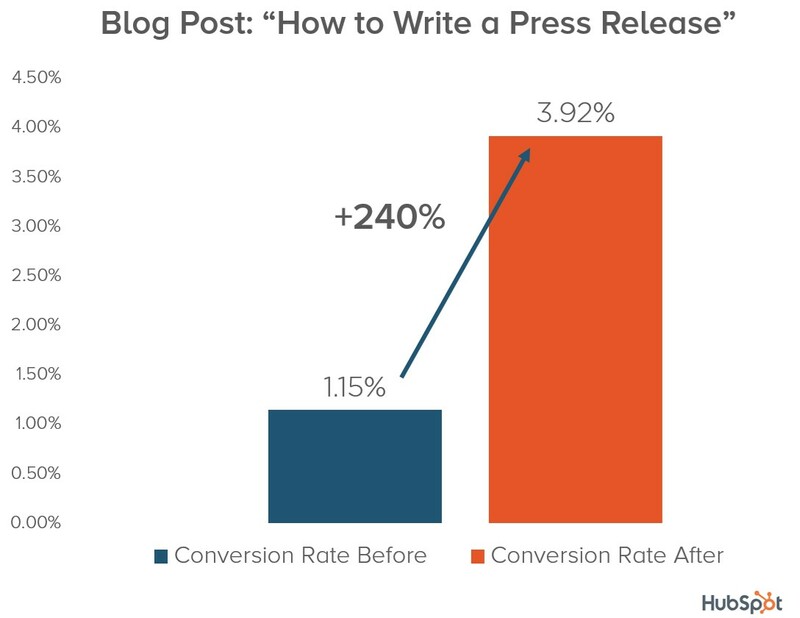 After a quick bit of research, Pam found that the keywords being searched for most to land on that page were "how to write a press release" and "press release template." 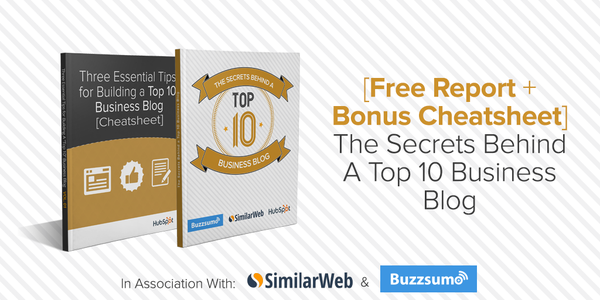 Once this was discovered, a new offer was created, which was a "free press release template" for download. The result has a huge 240% increase in the conversion on the page. This technique has been scaled out over 75 posts on the HubSpot blog and every single one of them saw an increase in conversion. Just as a note on this, if you're wondering how you can find out which keyword is bringing through the most traffic to your page, hop on over to Google Search Console and click on Search Traffic > Search Analytics. Once you're in this section, click on the radio button to view just pages (instead of queries). Find the URL of the page you're after (it's likely to be near the top) and then click on it. Now select the Query radio button; it will show you all of the keywords that have been clicked through to enter that page from the search engines. Thinking that you can just interrupt your way into someone giving over their email address isn't a great strategy. Seth Godin has been talking about this for years now. Whilst interrupting an experience can still land you results, you need to consider the wider impact on your website visitors. Whenever you're testing any new method of capturing email data, make sure that you're keeping a close eye on the impact it's having on bounce rate, pages per session and time on site. I've run tests with popups in the past that seemed to work well for capturing more email address but my bounce rate has significantly risen in the process. This is often the case when you display popups as soon as someone visits your site. One major consideration here, outside of the fact that more people are leaving your website prematurely, is that if they're coming from the search engines, so increasing your bounce rate could have a negative impact on your keyword rankings. Whilst you may be increasing your conversion rate, you could be decreasing your traffic at the same time. Just bear this in mind before you try anything new out, and test, test, test. One of my favourite methods for capturing email data is through locked content. Just to explain what locked content is, it's when you limit access to extra content until the user gives over their contact data. These locked content forms tend to convert much higher across my blog than any other data capture method, especially when the call to action is very relevant to the page content. If you want to set something like this up on your website, you can use the Optin Locker plugin (if you use WordPress). This is the exact plugin that I use. We do a lot of co-marketing at HubSpot, especially when we want to reach markets where we haven't got an existing large presence. We're not the only ones at it. The team over at BuzzSumo, one of my favourite tools, have been running a ton of co-marketing campaigns to gain some traction in the launch of their new SumoRank tool. 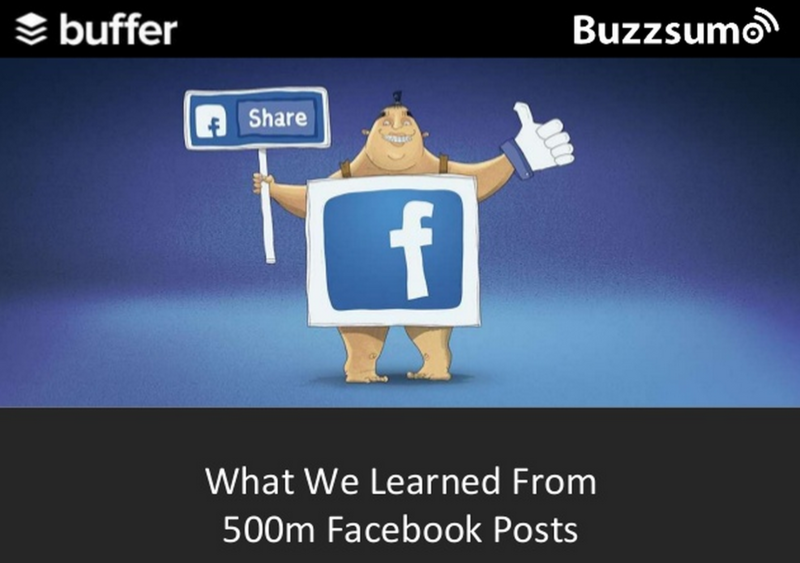 The above image is from the campaign that BuzzSumo ran with Buffer where they combined the data that both of their tools used to generate leads that could be shared amongst both companies. One of the huge advantages of running co-marketing campaigns like this is that you can utilise both of your existing audiences to dramatically increase your reach. If you ensure that you partner with someone that has a relevant audience to you, you're much more likely to get value out of the leads. You don't just have to partner up with one other company either. HubSpot recently ran a co-marketing campaign with both SimilarWeb and BuzzSumo, and I've seen campaigns in the past where there are many more partners involved in a single campaign. There's been a lot of debate surrounding opt-in/opt-out popups (or negative popups, as they're sometimes called). 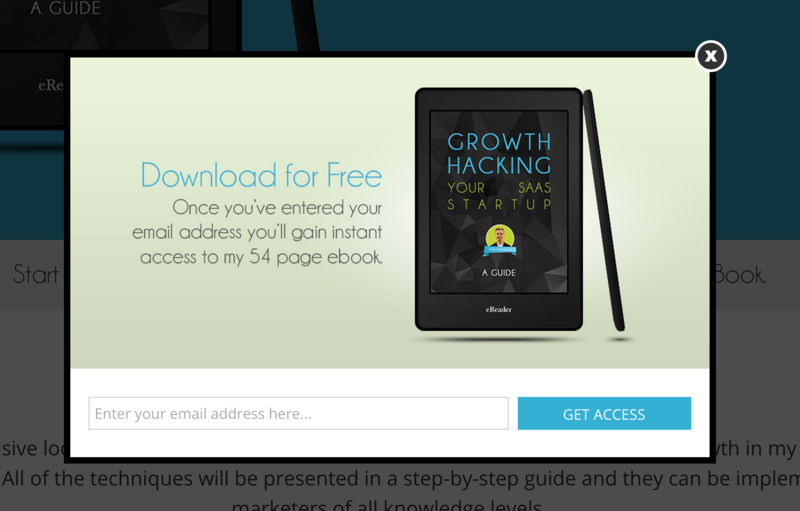 The team over at Copyhackers wrote an article at the start of 2014 that was very critical of using these types of popups, claiming that it was "outright trickery." Less than a year later and after few chats with Bounce Exchange, Copyhackers had "moved to the dark side" and started using these popups on their site. In fact, they're one of my favourite examples of how to run a fantastic popup that gives a positive user experience as well as incredibly high conversion rates. Not only does this pop-up give you a clear understanding of the value being offered, but they also offer a choice - a choice that is heavily encouraging you to say YES. The other great thing here is that the opt-out option (in this case "No, I reject the persuasion guide") isn't overly negative. By this, I mean that it isn't saying something along the lines of "No, I'd prefer to stay being an idiot." You'd be surprised how many popups I see with this kind of thing, and I really hate it. Copyhackers actually wrote a whole post around their decision to implement these kinds of popups and it's a good read, so make sure you check it out here. A more common tactic amongst SaaS businesses in particular is to create a free tool or service that is offered to your audience in exchange for giving away contact information. An example of this is the 14-day free course (that I'd highly recommend) that Justin Mares and Nat Eliason offer to grow their email list and then upsell people into their paid course at a later date. Free courses are becoming a more and more popular product to give away and they're proving to be very successful for lead generation. 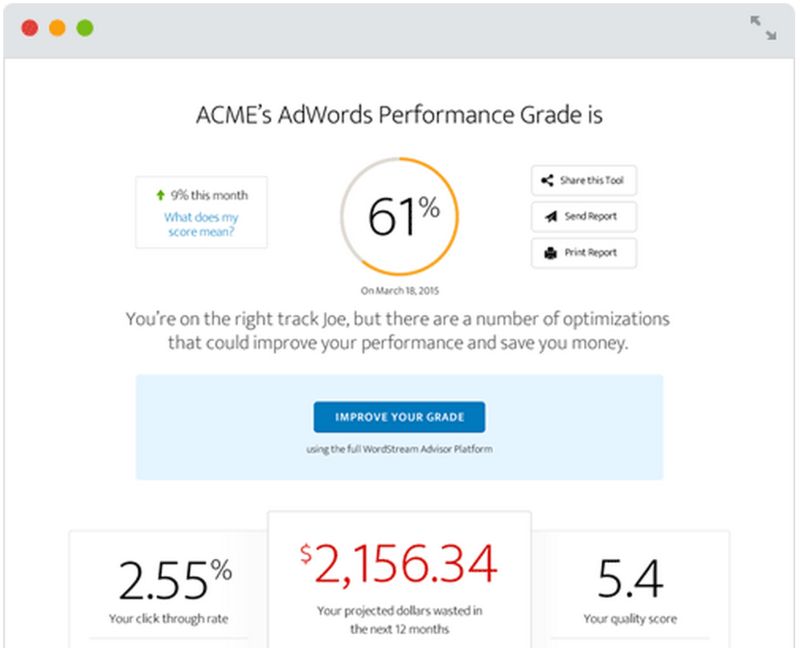 More of a tool-based example is HubSpot's Marketing Grader, a free tool that allows you to grade the performance of your website and get recommendations for improvements. Another similar tool is offered by WordStream that is more geared towards analysing the performance of your AdWords campaigns and providing you with a free report. The best thing about these tools is the fact that they solve a need for their target audience and offer genuine value whilst also remaining highly relevant to their core offering. This means that any leads that they generate will have a much greater chance of converting into paying customers later down the line. Without doubt, one of the biggest problems I see when it comes to lead generation and nurturing is the fact that the lead has been acquired on a false premise. Tricking people into handing over their email address may be effective for growing your subscriber list, but if you think those people are going to be valuable subscribers then think again. My advice: always make it clear what people are signing up for. If you set someone's expectation for what they're going to receive from you, they'll be much more receptive in the future. Simple things like having a double opt-in system is something that I'd highly recommend. This gives someone to option to remove themself from your list if they didn't mean to sign up. Some people may say that this is losing someone before they even have a chance to hear what you have to say but I'd make the argument that there should already be a level of trust in place before someone subscribes to your list. If that trust isn't there immediately, you're facing an uphill battle. Also, inflating your subscriber numbers like this can create real problems when it comes to measuring ROI. Offering a discount on products/services in exchange for signing up to an email list is something that I've done a lot within e-commerce projects. It's seriously effective for capturing people that may not be in the position to purchase at that moment but still have an interest in your product range. One way to really get the most out of this tactic is to run exit popups that are only displayed when a user is about to click away from your webpage. There are a number of different services that offer this functionality and one of my favourites is Optin Monster, which integrates with any CMS and is pretty cost effective. One of the things you need to bear in mind with offering a discount as a call to action is that your email workflow needs to be designed in a way that will quickly nurture the lead to the point of purchase. 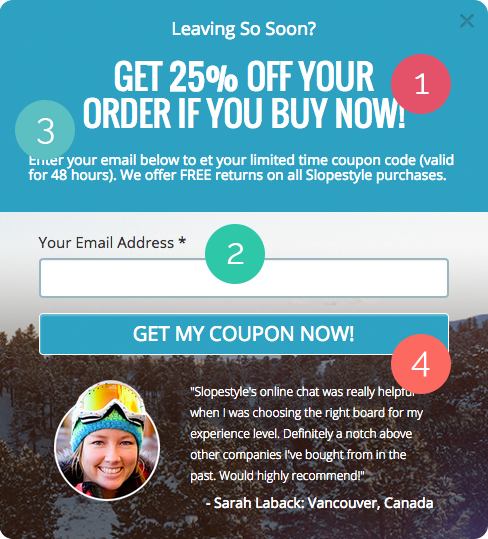 If someone is asking for a discount code, it's likey that they're close to being in a position to convert. 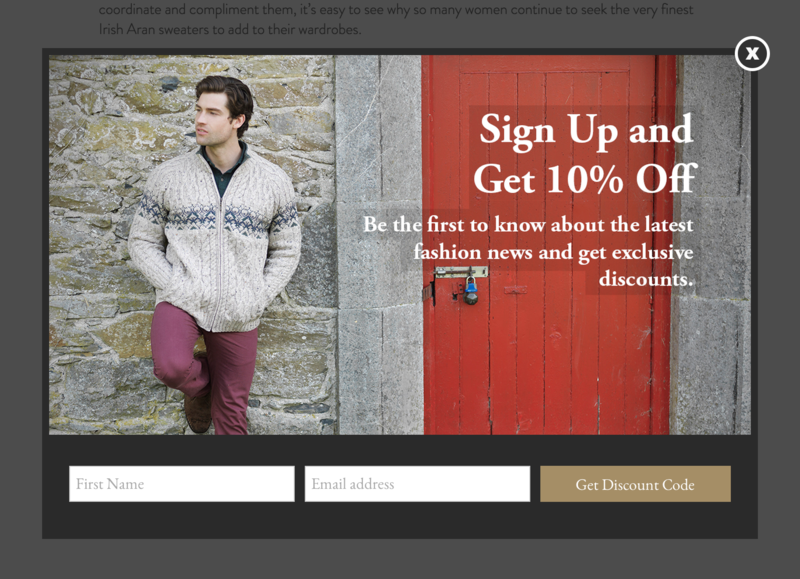 If possible, I'd recommend displaying the discount code on the webpage as soon as they've submitted their details. If that's not possible, ensure that you're sending the discount code to them immediately after they've submitted their details. This is an example that I really like from the team over at Wishpond. It has a clear call to action, sets the user's expectation really well, and clearly states that you will receive your discount now. Plus, they've even added an extra layer of trust with a testimonial. One of the problems that I've faced on my blog for some time now is that I tend to only write very long articles. I did some analysis a few weeks ago and my average article word count was over 3,000 words long. As a result, just having a call to action at the bottom of my content isn't always a viable option. One of the ways I wanted to get past the issue was to add a newsletter signup form within the sidebar of my blog. Again, the issue came up that as soon as people started to scroll down they would lose sight of the form and it wouldn't get filled out. The solution: a sticky blog widget. If you're wondering what the hell I'm talking about, just look to the right of this page and you'll see a form that follows you down as you scroll through the page. This is a sticky widget, as it remains in a fixed position in the reader's view even as they navigate down through the content. If you've got a sidebar on your blog, I'd highly recommend that you set this up. If you're using WordPress, you can use the free Q2W3 Fixed Widget plugin to set this up in a matter of minutes. These widgets are also great for promoting related content as well as lead capture forms, so it's a useful feature to have within your CMS. Most blogs I read nowadays have some kind of smart bar set up on them. 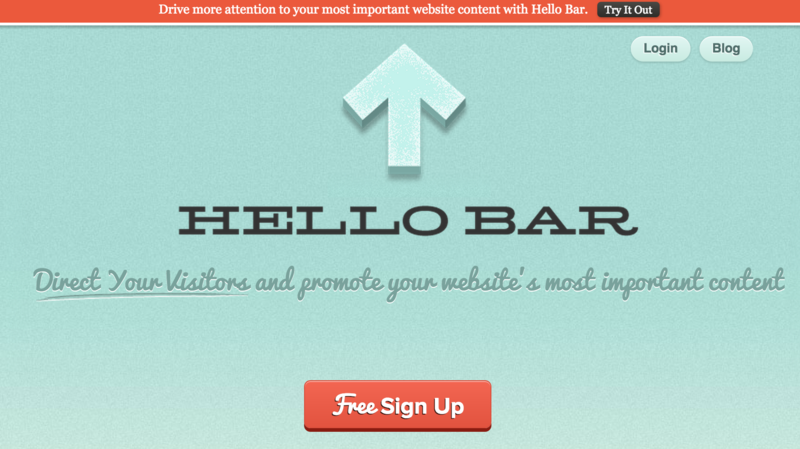 The above example is from Hello Bar, a free tool that you can use to set up fixed smart bars that display at the top of your webpage. I really like smart bars because they're relatively non-intrusive and tend to convert fairly well, especially if you're actually offering something within them. The smart bar that you see at the bottom of my website often converts at around 2%, which isn't bad considering the amount of effort it takes to set up and the minimal impact it has on user experience. If you want to take this to the next level, you can use a tool like IntroBar that allows you to show smart bars with tailored offers depending on which website the user came to yours from. For example, if a visitor were to come to your website from a link that was shared on Product Hunt, instead of you having to create a specific URL that gives discounts to Product Hunt members, you can just display a smart bar with a discount code that only they will see (as shown above). If you really want to step up your lead generation game you need to have landing pages that are designed to convert. Every offer that you create should have its own unique landing page that's focused around giving the reader a succinct explanation of what it is and why they would find it useful as well as a mechanism for them to input their contact information. Within the page, I give a brief overview of what's contained within the ebook, what you'll get from it, who it's aimed at and some recognition that it's received (i.e. sites it has been featured on). The call to action is also very simple, as you just need to click the "Download for Free" button and a small popup will appear asking you to type in your email (as shown below). Keeping things as simple as possible is essential for ensuring your conversion rates remain high. I often test out multiple variations of my landing pages to see which work best and seed traffic with some paid social ads to begin with just to get some early data. I'd strongly recommend testing on a small selection of your pages before broadening the test. On the flipside, I'd make sure that you test anything out on a large enough sample size before you make a site-wide change; running tests in stages is the easiest way to make this work. 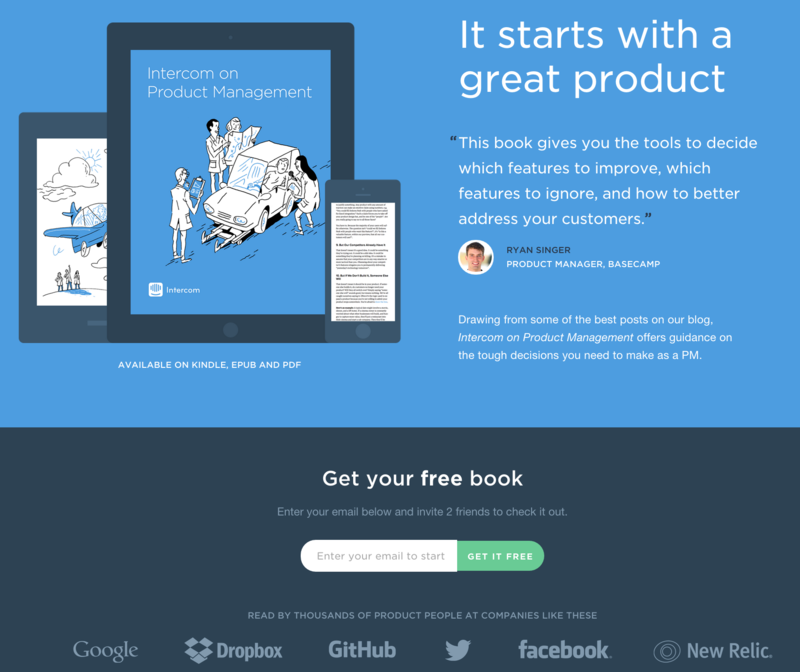 One of my favourite examples of a great landing page is on Intercom's website. Clear and concise value proposition above the fold. Trust being built through customer testimonials. Preview of what the content of the ebook looks like. Minimalist design that reduces any other distractions on the page. Like with most of the things I've discussed within this article, it's best to build up an initial hypothesis of what might work best when it comes to designing a landing page and then testing the results. This should be an ongoing process of testing, analysing and iterating to consistently improve results. No problem, Nick. Love some of the stuff you guys are doing. Great stuff Matt. As always … I read a lot of material on the Web, but you always come up with stuff I don’t know. Good on you! I seem to recall you’re in the UK, right? I am in Rome, Italy, and I love to see Europeans doing clever stuff as you’re doing. Matt, you’re most welcome. As I said, I appreciate the work you do here. Thanks for the offer to help Matt. I will definitely keep that in mind. You’re super kind. Awesome post! The last point hit home actually, because landing pages do make a world of difference. 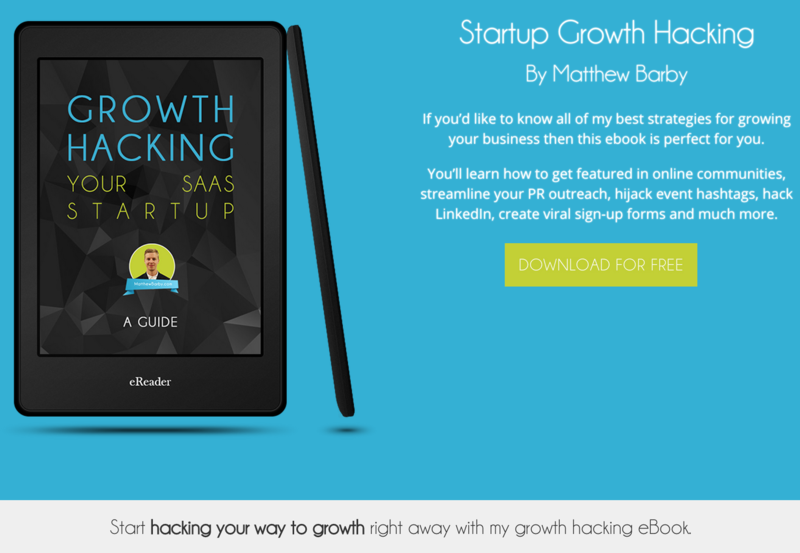 The Startup Growth Hacking landing page looks great. 🙂 What are you using to build your landing pages? Hey Shamir, thanks – I’m glad you found it useful. I’m not actually using anything in particular to build my landing pages other than WP – I coded that one up myself to just test it out. If you’re looking for good software to do this then I’d recommend HubSpot (naturally), Lead Pages or Unbounce. I picked up a lot of tips and strategies from the post. I like the idea that you including the point on adding in “minimalist design”. Because there’s nothing more distracting than the design itself aside from the chaotic graphic and then the pitch. Thanks for sharing your insights. Really helps! Amazing techniques and lots of value in one single post. Love the example popups, interesting Collection for brainstorming. As per usual, your content is epic and beautiful to look at, may it be as shared as it deserves. Great post Mat. I’ve been looking for this type of information since I have started a new personal blog and I am definitely in need of a quality strategy on how to build an email list. By the way, I really like the design of your website. Did you build it yourself or you have hired someone? Thanks, Vukasin. I worked with a freelancer around 2 years ago to have it developed (https://twitter.com/mjtweaver). Thanks for sharing this blogs and ideas for more chances of conversion using email. I just Love the tips. it was so helpful for me for email marketing. I am started list building recently and I am using Aweber sign up form as lead magnet, the conversion rate is very low and one week I implemented SUMO me it is giving me good results, all we have to do is test and trail everything to find out which works for us. I found this article very useful because I never tried all these things till now, one by one I will implement your tips on my blog to build list, thanks a lot for sharing this information. Great post as usual. Already on top of most of these tips…but had no clue about the single-option aversion study. Definitely going to be something to test. Will definitely share this around because this post is a must-read. Excellent article Matthew. Consumers and visitors are mostly influenced by their impulses. In that regard, people who are able to master psychology are those who are able to reap the rewards. In fact, this entire guide speaks how you can help someone in order to help yourself. By the way, have you ever had situations in which you did everything properly, treated a person with respect and still lost him? (regardless whether he was a potential fan, visitor, customer or whatever). Haven’t stopped reading your blog since I came across it a few hours ago. Absolutely love it, and your site is absolutely stunning. That’s great to hear, Greg – thanks! Very interesting to see a number of different approaches working well for different companies – setting up the right tests can be a difficult thing to get your head around at first. If you don’t ask the right questions and set yourself up to measure the right metrics, you’re not going to get useful results! Just discovered your blog today, and I must say – it’s GOLD! I’m learning so much with every blog post you publish! Your blog is so insightful! Thanks Matt for email marketing tips. For building an email list I have found tools like Aeroleads.com and Selhack.com which also provide Google Chrome Plugins to find verified email addresses. Very nice content matt.I agree on your point that landing page makes a difference because they are the most important part of campaigns.